With a career that has garnered 20 gold and platinum records over the course of 24 albums, it would seem that Bruce Cockburn has done it all. Yet, with his latest effort Breakfast in New Orleans, Dinner in Timbuktu, this talented singer/songwriter/guitarist just may have outdone himself once again. The disc finds Cockburn returning to a more acoustic-based sound than on recent outings. As such, Breakfast in New Orleans, Dinner in Timbuktu seamlessly merges his folk-rock beginnings with both his mid-period quest for spirituality and his more recent world music explorations, and the result is nothing short of stellar. Once again, Cockburn's lyrics read like fine poetry, and as usual he's not afraid to show a glimpse of his own personality amidst a backdrop of global images, political musings, and raw passion and emotion. These are as much love songs for an intimate partner as they are for humankind, and Cockburn delivers them with soothing vocals that shift from spoken-word dreaminess to exquisitely sung melodies. The musical arrangements only serve to enhance Cockburn's lyrics, enveloping them with aural portraits of his never-ending journeys. Anchored by his complex trademark acoustic guitar rhythms, his songs settle as deeply and easily into the jazz and blues heritage of New Orleans as they do into the mesmerizing swirl of African, Middle Eastern, and Brazilian music. Breakfast in New Orleans, Dinner in Timbuktu is the brilliant culmination of a career that spans three decades, but it's also the work of an artist who shows he still has a lot to say. It's the type of music that is not to be taken lightly. Yet, like Paul Simon's Graceland and Rhythm of the Saints, it's also the kind of music that can be. 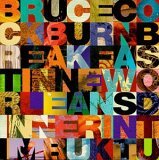 In other words, whatever your mood or musical inclination, Bruce Cockburn's Breakfast in New Orleans, Dinner in Timbuktu will suit it perfectly.